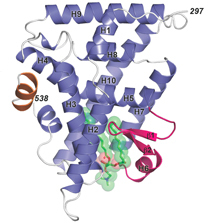 This diagram shows how the nuclear receptor protein LRH-1 (shown in purple and pink) wraps around the phospholipid DLPC (green). DLPC was shown to have antidiabetic effects in mice, and a detailed knowledge of DLPC's molecular interactions could help scientists fine tune it for clinical applications. A trace component of lecithin called DLPC (dilauroyl phosphatidylcholine) was recently discovered to have antidiabetic properties in animals. When fed to diabetic mice, DLPC could increase insulin sensitivity and reduce fat accumulation in the liver. Now scientists at Emory University School of Medicine have obtained a detailed molecular picture of how DLPC fits into LRH-1, the protein sensor that triggers its effects. The structural information gives hints about how beneficial dietary fats regulate metabolism and could help researchers tweak DLPC to work best in humans. The results were published online April 15, 2012 in the journal Nature Structural & Molecular Biology. The first author is Paul Musille, a graduate student in Emory’s Molecular and Systems Pharmacology program. Working with Eric Ortlund, PhD, assistant professor of biochemistry, Musille used X-rays to map how LRH-1 protein and DPLC fit together. Postdoc Manish Pathak and graduate student William Hudson also contributed to the paper, along with scientists at Scripps Research Institute in Florida. While DLPC shows promise, it may have side effects, Ortlund says. For example, the LRH-1 protein has also been shown to have a role in the development of breast cancer, so activating LRH-1 could potentially promote breast cancer. LRH-1 (liver receptor homolog-1) is a nuclear receptor, a type of protein that can sense the presence of hormones or vitamins. Each kind of receptor has a corresponding “ligand,” such as estrogen or vitamin D, which causes the receptor to change shape and turn on genes. Several laboratories have been studying how LRH-1 regulates genes involved in managing fat, bile acids and cholesterol. DLPC’s effects in mice were reported last year in Nature by scientists at Baylor College of Medicine and Scripps Research Institute, with Ortlund and Pathak collaborating. A clinical trial at Baylor is underway exploring beneficial effects of DLPC in patients with early signs of diabetes. DLPC is a trace component of lecithin, an emulsifier found in many foods and also available as a supplement. The 2011 Nature paper showed that DLPC activates LRH-1, while similar molecules do not, apparently because they are too big or too small. In this paper, Musille and Ortlund describe how LRH-1 changes shape when it wraps around DLPC, in a way that is different from other nuclear receptors. They also show how it can turn genes off in the absence of a ligand. Ortlund says he is working with Emory chemist Jim Snyder and colleagues at Imperial College, London to study synthetic activators of LRH-1 and map what is necessary for activity in different tissues. Synthetic compounds that block LRH-1 activity could also be helpful in breast cancer treatment, because they could act similarly to aromatase inhibitors, but more selectively, Ortlund says. The research was supported by the National Institutes of Health and Emory University. Reference: P.M. Musille, M.C. Pathak, J.L. Lauer, W.H. Hudson, P.R. Griffin and E.A. Ortlund. Antidiabetic phospholipid-nuclear receptor complex reveals the mechanism for phospholipid-driven gene regulation. Nature Structural & Molecular Biology (2012).